Espacios Abiertos, a nonprofit that seeks to empower society, on Thursday urged the government to provide data on the tax privileges that constitute a considerable amount of the island’s resources, particularly in times of crisis in which austerity measures are perceived due to a shortage of funds in the public coffers. “In the midst of the economic crisis, there is an invisible spending: the hidden budget,” said Nuria Y. Ortiz-Vargas, executive director of the organization, during a roundtable with the media. In the recently approved Fiscal Plan, the government committed itself to a reduction of these expenditures without knowing what is spent or not spent, she said. “What is the real impact of reducing tax expenditures by $4.2 billion over the next nine years without a record that helps us glimpse how much and what is spent? Will the elimination, reduction or alteration of these contributory privileges respond to a policy to improve the socio-economic situation of Puerto Ricans or favor particular interests as a result of the clientelistic practices that have done so much damage to Puerto Rico?,” she questioned. “In a fiscal crisis as critical as the one we live in, a public record or fiscal spending budget is indispensable. This report will improve government transparency and accountability,” Ortiz-Vargas said. “With this mechanism we will save money because it will allow evaluating these tax privileges and will help to determine which should be modified or evaluated,” she added. 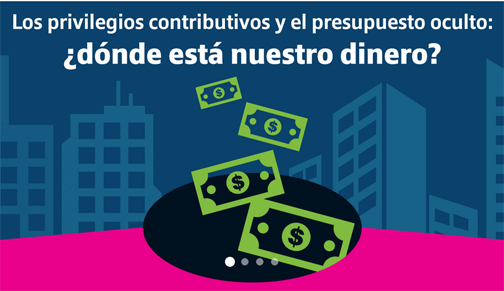 Daniel Santamaría-Ots, report author and public policy analyst for Espacios Abiertos, said that tax incentives or tax expenditures are granted in various ways and are carried out through the tax code. Such incentives constitute an estimated loss of revenue by a government as a result of giving exclusions, exemptions, deductions, tax credits, preferential rates or deferrals of tax obligations to a particular class of taxpayers or business activity, he said. This loss of income is equivalent to increased public spending and as such should be recognized in the state accounts, he added. Governments in various parts of the world, including Puerto Rico, find it attractive to provide tax incentives because they do not face severe scrutiny like other public spending initiatives being discussed in the budget, the report noted. Because the publication of these fiscal expenditures is much looser, they tend to be permanent and do not usually document their effectiveness or measure their success or failure, the report added. The document points to examples of countries that have succeeded in accounting for and making visible to the citizens where the money goes from these tax privileges, such as the U.S. mainland, where 44 of the 50 states publish a report periodically on tax expenditures that allow them control over their public policy of total government spending. At the beginning of the 1970s, only the U.S. mainland and Germany published them. In 1983, Australia, Canada, France and Spain already identify and report on a regular basis. At present, almost all member countries belonging to the Organization for Economic Co-operation and Development have an official registration or fiscal expenditure budget as well, the report noted. Santamaría-Ots said two recent studies have been done in Puerto Rico on these tax privileges, by KPMG and by economist Ramón J. Cao-García, and that several news media have been tracking what happens behind the scenes in the decisions of how much and who benefits and in exchange for what, but at the present time there is no precise information that citizens can access. Hey Buddy!, I found this information for you: "Espacios Abiertos urges gov’t to account for money". Here is the website link: https://newsismybusiness.com/espacios-abiertos-account/. Thank you.